You’ll Love These Vegetarian Summer BBQ Recipes! To create this marinate, simply mix all of the above ingredients together. 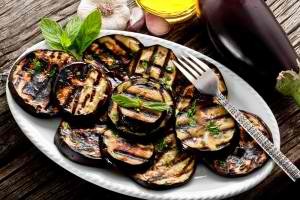 Slice the eggplant, and apply either during grilling, or prior to grilling for some added flavor! Begin by heating the olive oil in a medium pan, and then fry the pine nuts until they are toasted. Add the rice, and fry until glossy. Stir in the garlic, add the vegetable stock, and bring everything to a boil. Cover and then cook for 10 minutes or until the rice is tender. Remove the pan from heat to allow it to cool, and then stir in the spring onions, cherry tomatoes, mozzarella, Gorgonzola and fresh herbs. Now it’s time to stuff the peppers. Cut the stalk from the pepper, remove it, and then make a slit length-wise. Remove the seeds and membrane, and then spoon the filling into the cavity. Take about 2-3 feet of kitchen string and wrap it around the pepper stalk numerous times, tying it firmly so that the filling is secured. Then barbecue the peppers over medium heat for 15 to 20 minutes, turning gently so that the peppers are browned evenly.